<>, Inspire-O-Gram, "Give this gift to yourself this Christmas." Welcome to the Christmas edition of Inspire-O-Gram, packed with nonfattening fun stuff for you! Let's jump right into our main article, eh? If there's one trait most of us singles share, it's that we're often too hard on ourselves. We criticize ourselves and mentally beat ourselves up for every mistake, large, small, real or imaginary. It's not healthy, and it needs to stop. How about giving yourself a Christmas present this year, a truly meaningful, life-changing gift? How about stopping the self-abuse right now? If you've already done so, good for you. If not, this is a great time to put an end to it. Over the years, I've come to realize that God has good taste. He doesn't go in for crap, if you'll excuse my vulgarity. With him, it's always the best. It's an old cliche that God doesn't make junk, but it's true. He made you, and he said in his Word that his creation is very good. Sure, we all make mistakes. I've made more than my share. But when it comes to sin, deliberately stepping out of God's will, he readily forgives us when we confess, repent, and move on. Once God forgives us, we need to forgive ourselves, too. That means no more bringing up dumb stuff from years ago, no more dragging a heavy suitcase of guilt around with you, no more characterizing yourself as a loser or worthless. This Christmas, give yourself the gift of seeing the potential in yourself that God sees. He has lots of work to do here in bringing people to himself, and you can help, through your actions and example. Nonbelievers are watching. If we don't act as if Christianity is the best thing on the planet (which it is), they won't be attracted to the faith and to Jesus. When we stand tall and live with joy, hope, and confidence, nonbelievers will want what we've got. One of the truths about our faith I love the most is that the Holy Spirit is always eager to help us start over. He doesn't care if it's for the millionth time, he's always ready to give all the help we need to see ourselves anew. He's the real presence of Jesus Christ living inside you, and it doesn't get any more exciting than that. How about it? How about giving yourself the present of forgiveness, faith, and hope this Christmas? The coming year will take on a whole new light when you accept the truth that the creator of the universe has an enormous, neverending love for you. Accept his love and run with it in 2008. Give yourself that special Christmas gift this year. as we're just having fun. before he starts his nap. from your Father's loving hand. and that's why I stop to pray. the forgiveness that you bring. to my Savior and my King." If you think the reason for Christmas is gifts and parties and decorations, you got lost in the advertising somewhere. No question, those things are all great and they make this season special, but Christmas is about a scared young couple, unsure of what was happening to them, starting a marriage with little more than faith in God, but that was enough. It's about the fulfillment of a plan conceived by God before the dawn of time, a plan of indescribable love toward a floundering race of creatures--us. Christmas is the Greatest Story Ever Told, and one of the main characters in it is you. Take that thought to bed with you as you doze off Christmas Eve. Meet Christmas morning celebrating God's gift of eternal happiness--for you! Grab these 2 Christmas F'reebies! 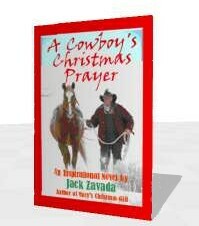 If you haven't picked up your absolutely f'ree copy of my new novel, A Cowboy's Christmas Prayer, you can download it (without any annoying signups or sneakiness) at: www.inspiration-for-singles.com/cowboy.html. But if you like modern Christmas stories, last year's f'ree novel is still available, and has had more than 12,000 downloads so far. Mary's Christmas Gift is available f'ree at: www.inspiration-for-singles.com/mary.html. Yikes! Christmas! F'ree! Could life get any better? Christmas can be a tough time for us singles, can't it? But you'll find a wealth of encouragement and help at christianity.about.com. I hope you enjoyed this special Christmas issue of Inspire-O-Gram. If you'd like to comment or just send a postage-fre'e Christmas greeting, you can use this nifty contact form. Have a big, happy, peace-filled Christmas and a great New Year! See you back here in January!